For this project I used the Koski Flight Suit from Pixie Faire, with the intention to dupe the official American Girl brand NASA flightsuit, but I made some changes and if I make it again I will make even more changes! Overall it was a good pattern and pretty easy to make, with excellent details and options that you can skip for a simpler suit if you want. I found the pant legs are too short and the crotch was waaaay too small. I ended up having to add a gore to the crotch seam to make it work. (User error?) I'll try to remember to take a picture of the gore. The pockets were also...well, I don't know if you can tell form the picture, but the breast pockets aren't perfectly symmetrical (my fault). The official AG version appear to have fake pockets outlined in stitching, which is lame. This pattern gives the option for zippered pockets or these welt pockets, which I opted for. I highly suggest doing a few practice welts! It took a few tries to get it to look good. I also found that the breast pockets are positioned too high on the shirt front and didn't leave room for any patches above them. And the knee pockets...um, why are they on the knee? I had flaps over the top of them cargo-style but they looked really goofy so I removed them. I thought about removing the knee pockets completely, but decided against it. If I make it again, I'll either skip them or move them to the outside of the leg, along the seam, like actual cargo pant pockets. The last big change I made was sewing down the belt in the front rather than using the velcro. I think it would have been too bulky with the velcro, and it's not really useful for my doll's belt to come off since it doesn't do much synching on this pattern. The patch! I am very proud of how this turned out! I printed out an American flag (mirrored) onto iron-on transfer paper and transferred it onto white fabric. 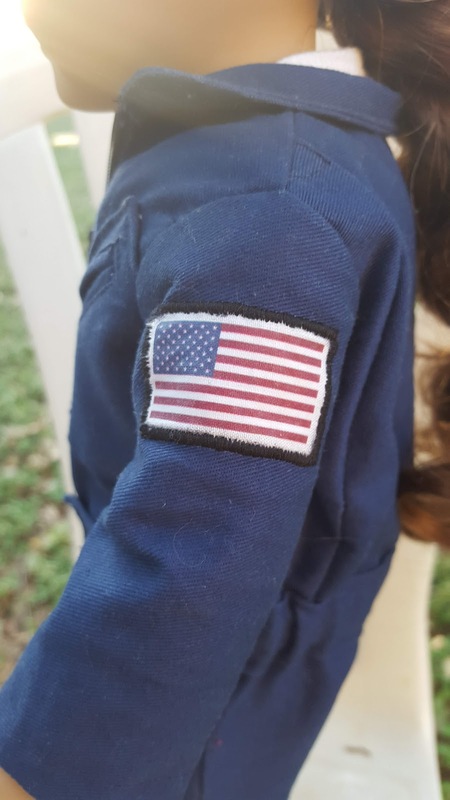 Then I cut that flag out and used my buttonhole stitch setting on my machine to attach it to the sleeve. There were a few small gaps which I used a permanent marker to fill in. I think it looks great! I'll be using this technique again, definitely. I wanted to do that NASA logo on the front, but there wasn't room above the pocket, and I didn't think to do it onto the pocket itself before I sewed the pocket onto the front of the suit. I think I'd use this pattern again too! I'm playing Portal II with my boys right now and this pattern would work great for an Aperture Science test subject costume! And um. 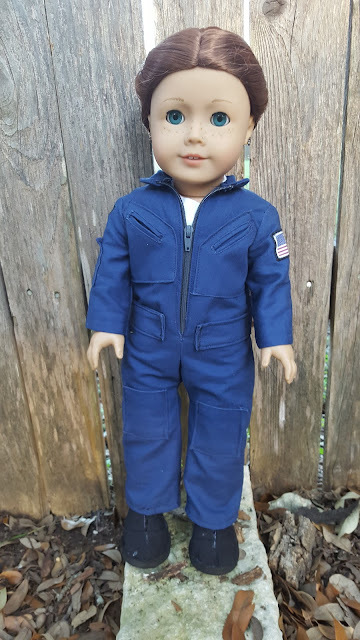 Yeah, it's a new doll. 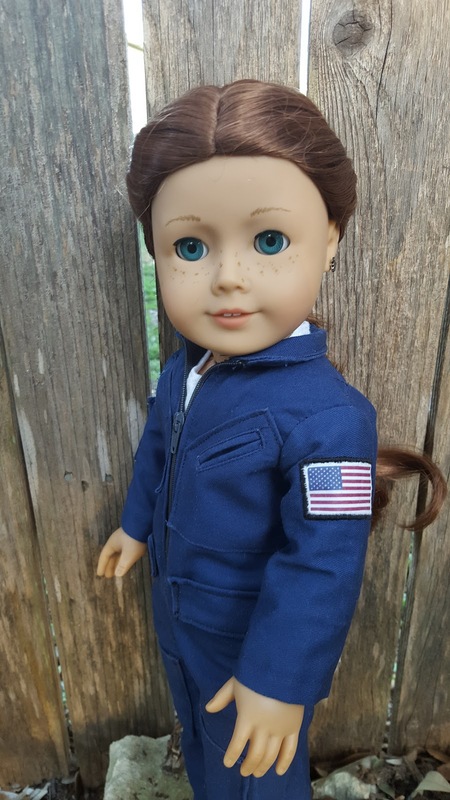 I got a really good deal on this used doll "Saige" in a facebook group, and she reminded me of Cordelia Naismith Vorkosigan, the titular character of the book Cordeila's Honor by Lois McMaster Bujold, which you really should read if you like science fiction. Plus, my kids all LOVE the dolls. It's so sweet to see Rosemary's face light up and watch her hug the doll (which is almost as big as she is, seriously!). I don't plan on buying any more dolls, but I'm having so much fun with this right now, who knows?